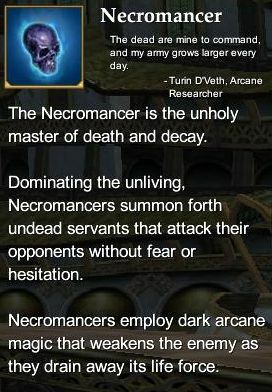 The Necromancer is ideal for any who are intrigued by the mastery of death and the commanding of undead servants. The Necromancer is able to summon a wretched undead servant to attack his enemies, and use the powers of death to weaken and destroy his enemies. See Necromancer Pets for a table of all your pets and the different appearances. Intelligence (primary) - Increases your damage and maximum power. Necromancer Epic Weapon Series (80) - Rise of Kunark Necromancer Epic Weapon. This page last modified 2011-08-25 22:54:44.